Watsapp text from a Manchester United supporter, 42 year old client. Client: Morning Bro! CareShield Life how? What do we do? Thanks. Me: Sir Alex better or Jose better bro? Client: Whoever win more trophies! Client: At least for now. What has that got to do with CareShield Life and ElderShield? Me: Whoever gives you better coverage…whichever gives you better coverage bro. Client: So for me, should I switch? Me: Long story, let’s do lunch. Singapore citizens and Permanent Residents who joined ElderShield on or after 30 September 2007(i.e. age 52 and older in 2018) will be under the ElderShield 400 scheme which provides a payout of $400 monthly for 6 years. A good portion of this group of people under the ElderShield 400 scheme will be able to switch to CareShield Life when the scheme is launched. In fact, for Singapore Resident born between 1970 and 1979, they will automatically be switched over to be covered under CareShield Life (if they are already under the ElderShield 400 scheme and are not severely disabled) in 2021 and will have until 2023 to opt out from the CareShield Life scheme. This option to switch has naturally created the question if the switch will be beneficial and should be considered. To understand better, we will need to learn about the difference between CareShield Life and ElderShield. 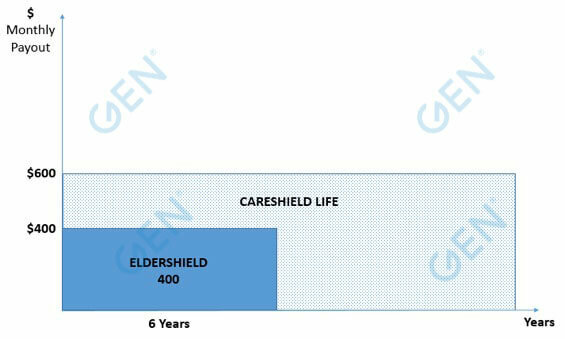 How does CareShield Life differ from ElderShield? As an enhancement to an insurance scheme, the focus will naturally be on increasing insurance protection and coverage to existing ElderShield policyholders. As you can see, the increase in coverage will be enhanced by increasing the “How much” and the “How long”. The “how much” have been increased from $400 a month in insurance payout to at least $600 a month starting from year 2020 (with an incremental rate of 2% per year, for the first five years of CareShield Life implementation and subsequent adjustments will be reviewed regularly). For example, a policyholder who is insured at age 30 in year 2020 and 10 years later at age 40 needs to make a claim, the monthly insurance payout will be about $731 (i.e. assuming $600 growing at 2% a year for 10 years). The “how long” have also been increased from a duration limit of 6 years to lifetime payout. This means that if long term care is needed for a period of 20 years, the insurance payout will continue for 20 years, and not end after 6 years in the current ElderShield 400 scheme. When I’m out explaining to people about the need to have long term care insurance coverage, it can be quite a challenge explaining the concept and the need. For some, there are doubts about the possibility of long term care happening to them. For others, there are doubts about the possibility of not being able to make a claim even if disability were to happen as it may not be serious enough to successfully claim under the definition of being unable to perform 3 of 6 “Activities of Daily Living” (ADLs). Yet, there are others for whom this is a much more straightforward discussion. They understood the need, they have a good sense about how much it can potentially cost and they do not want themselves (or any of their family members) to assume this potential financial risk. 1. How much – In a recent study, it is estimated that each senior in Singapore will need an average of $51,000 a year to provide for health care costs by the year 2030. If we explore deeper into the study, Singapore is in Group 1 or the “Money-Rich, Time-Poor” Group and the Long Term Care component is estimated to be 45%. This means that from 2030, long term care will cost $22,950 a year or about $1,900 a month in Singapore. 2. How long – It was mentioned during the National Day Rally 2017 that currently, Singaporeans live on average to 82 years old with 8 of those years experiencing ill health. These are average numbers and it is possible for the unhealthy years to last beyond 8 years. Also, unhealthy years are not exclusive only to the seniors or the elderly. A young person may experience years of ill health requiring long term care after suffering from accidents such as a motor accident or a serious illness such as stroke. 3. Who pay – Beyond the maths, this is the real issue. Caring for ourselves should be our personal responsibility and that is true…but only to a certain extent. When we are born, we are not independent and using Maslow’s language, we don’t provide for our physiological, safety, belonging, esteem and self-actualisation needs all by ourselves. We need our parents (caregivers) to feed us, protect us from harm, keep us feeling loved, tells us how great we will be and buys an education policy to allow us to pursue our dreams when we figured out where our rainbow takes us. We have all gone through a period of dependency and we will very likely, on average, go through another such period again. And just like the first time when we were a dependent, it is very likely someone else will pay for it, unless we plan for ourselves in advance. Long term care is a personal financial maths problem that many will be unable to solve. We are talking about an amount of $182,400 (in 2030 dollars) that on average will need to be paid primarily from our own savings, at probably the most inconvenient stage of our lives when our physical, emotional and financial health is at its most vulnerable. This is why I believe that most of the long term care costs, despite being a personal responsibility to begin with, inevitably ends up being paid for by someone else – and usually someone closest if planning is not made in advance to provide for the financial costs. Beyond the costs that can be measured such as nursing, therapy and home help, the loss of income from a family member who takes on the role of primary care giver could well the biggest financial loss in the whole equation. Where do Long Term Care Insurance such as ElderShield and CareShield Life Fit in? Long term care insurance are funding mediums for a specific stage of retirement – the “No-Go” years. I use the “3 Phases of Retirement” concept as a guide on how to plan for retirement and this makes it easy to understand where different types of financial instruments fits in best. During the third phase of retirement (i.e. “No-Go” years), people lose their independence and it is usually triggered by a loss of health (e.g. stroke, heart attack or even severe dementia). This means that for people in the “No-Go” years, it is no longer safe for them to be alone. Oftentimes, this will mean that someone in the “No-Go” phase will have to move in with a family member, have a family member move in with them, hire a full time helper or move into a care facility. All of these options will involve additional costs and this is where long term care insurance such as ElderShield and CareShield Life fits in to provide the funds for such needs and services. 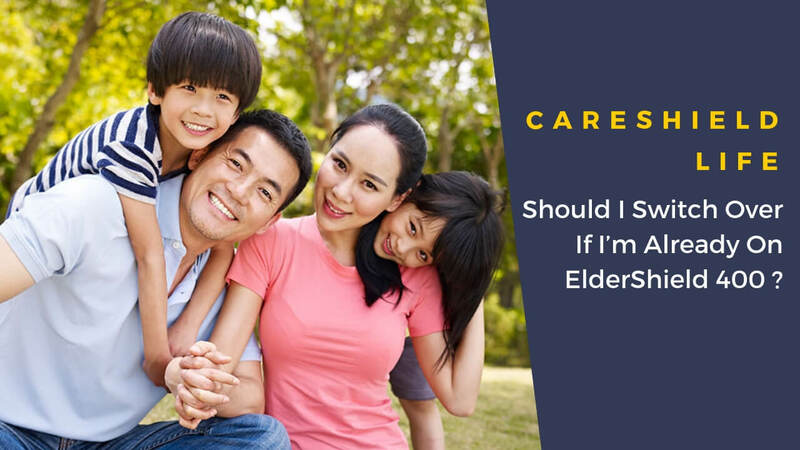 Being Specific – Should You Switch to CareShield Life if you are already on ElderShield? The full and exact premium schedule for CareShield Life is not known yet so to decide based on a comparison of cost and benefit analysis may not be the best approach. In fact, until 2021, there is no possibility of making a switch so the immediate decision to make is not on switching over to CareShield Life but rather, what should you do with your current ElderShield plan in anticipation of the possibility to make the switch in 2021. This can be for many reasons. For example, the additional budget to enhance your coverage may be a concern or you do not see long term care planning as a priority yet you don’t mind having some form of basic coverage “just in case”. In such a situation, you should make the switch from ElderShield to CareShield Life when possible as both premiums can be fully funded using CPF-Medisave funds and you can get an enhancement of coverage at the basic level. This is usually due to health reasons. You appreciate the importance of having more insurance coverage for Long Term Care and tried to apply to upgrade your coverage but was declined due to existing medical conditions. In this case, making the switch to CareShield Life will be beneficial as you are able to enhance your insurance coverage. Do note that the switch is only possible if the existing ElderShield policyholder is not already severely disabled. This is, in my opinion, a situation where there is a “maybe”. CareShield Life has no doubt provided an enhancement in coverage compared to ElderShield but this does not mean that CareShield Life is designed to be a comprehensive long term care insurance plan. Like ElderShield, it provides a foundation but the foundation alone will not complete the building. Let’s use an example of someone planning to have an additional $1,900 a month in income should there be a loss of independence. This person enrolls into CareShield Life at age 30 at year 2020. At age 67, the monthly payout for CareShield Life is about $1,250 (assuming growth of 2% from the $600 monthly payout for 37 years) upon a claim. While the payout has increased over the years, there is still shortfall of $650 a month. By upgrading your existing ElderShield coverage first to the level of coverage you want (e.g. monthly payout of $1,900 a month), you can immediately enjoy the enhanced coverage as well as “lock-in” your good health so that even if your health status changes later on, you are already well covered without the need to switch to CareShield Life. When the full details of CareShield Life are available in 2020, including the type of supplements available, you can then decide which option is better for your needs ensuring you will never be worse off in terms of coverage. Long term care is a big unknown. If it’s never needed, the impact of whether you have insurance or not will not be significant. If it is ever needed, the impact of whether you are sufficiently insured may be the difference between financial independence or financial disaster. If we look at the averages, both CareShield Life and ElderShield are not likely to sufficiently provide for a peace of mind when loss of independence happens. Instead of waiting for public schemes to match your needs, it will be better to take control and set up your own plans tuned to your own needs and expectations. For a start, consider upgrading your long term care insurance coverage to $1,900 a month in payout should loss of independence happens. 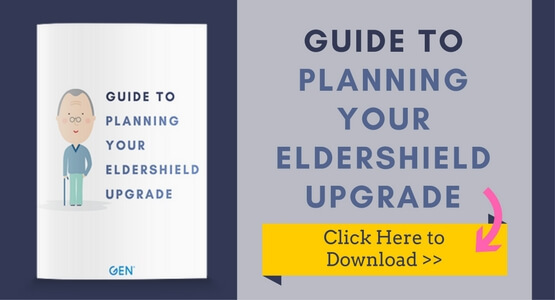 You can use this Guide to Planning Your ElderShield Upgrade which includes a premium projection table for upgrading to $1,900 a month in ElderShield benefits as a reference. I like to think of long term care as a maths problem. In this case, it’s a maths problem that needs to be solved in the middle of the night when fatigue has set in and we are most tired. Pen and paper are good, abacus is even better but if I have to solve maths problems in the middle of the night, I want a calculator and good long term care plan done in advance is that calculator. Good luck and may you have the tools all ready when the time has come for you to solve your maths problems! If you want to know more about ElderShield Upgrade or any other enquiries, you may contact me through whatsapp, schedule an appointment with me or fill up the form below and I will get back to you as soon as possible. Life Insurance for Children - Do they really need it?